Two of my respondents to my discussion of Audience Spirituality, which we also term Spectator Spirituality, have commented on how liturgical worship makes people into participants, rather than mere observing spectators. I join my friends Cristo and Cathy in their respect for liturgy and its great value. In liturgical prayer everyone has an opportunity for intelligent, coordinated personal and communal participation. For me too, it is a wellspring of life. But it ain’t necessarily so. Not by a long shot. What is Liturgy and How Should it be Done? The etymology of the Greek word leiturgia indicates that the “liturgy” is the worshipful service the people render in the presence of God, just as did the priests and Levites in the Holy Temple. It is the lay-energy–the work of the people. Keeping the priests and Levites in mind, there was no time in their lives when priests and Levites were more attentive to what they were doing than when their time of service in the Temple came up. This was above all no time for spacing out, not only because you might miss something, but also because such carelessness could be fatal when laboring so close to the manifest Presence of the King of Kings. Perhaps you will remember the story of Uzzah, a Levite who got careless with his duties, touched the ark of God which he should not have touched, and did not survive to tell the story. Again, following the pattern of the priests and Levites, the liturgy is no time to space out. Instead, it should call for our most intense attentiveness. But is that we find in our own services when liturgy is being read? I don’t think so! In many Messianic congregations liturgy is minimized, reduced to the recitation of the Shema and a couple of b’rachot along the way. And for many congregations, a division is made between “the worship,” songs and dancing, and the “liturgy.” which is in almost every case a half-hearted bow to a tradition which is being “honored” with a tip of the hat (!!) but not really implemented or rightly understood. A reading of the Book of Malachi should serve as a stiff warning about being ho-hum in our liturgical practice. Read it and you will see for yourself! This applies to many, nearly all Messianic Congregations. In too many congregations people are saying words they don’t understand which apply to someone else and calling that liturgy. It is not. It is actually just a lot of religious noise, what Paul called elswhere, “a resounding gong or a clanging cymbal.” There are many fine Gentile people in Messianic Congregations saying prayers that are particular to the Jewish historical experience and covenantal identity. And it is an exercise in confusion or meaninglessness when largely gentile Messianic Congregations say these prayers. Here’s a simple example. The blessing over the Torah blesses the One who gave us the Torah, saying, “asher natan lanu et Torato–who has given us his Torah.” Now we all know that it was God who gave the Torah. so we are blessing him. But to whom was the Torah given? The Apostle Paul answers that question saying in Romans 3, “Then what advantage has the Jew? Or what is the value of circumcision? Much in every way. To begin with, the Jews were entrusted with the oracles of God,” and then in Romans 9, “They are Israelites, and to them belong the adoption, the glory, the covenants, the giving of the law, the worship, and the promises.” Paul would entirely understand and agree with Jews praying this Torah blessing. But he would be confused at best by Gentiles praying it–a blessing that does not apply to them in a language they do not understand. Now many will say, “But the Gentiles have been grafted in!” Granted! But Paul takes pains to say that Jews remain natural branches, and gentiles, wild olive branches, even after having been grafted in. The Gentiles are now children of Abraham. But Paul didn’t want us to be confused: they are not Jews. Am I speaking against Gentiles here? Of course not! But I am speaking against confusion, and there is much theological confusion afoot in the Messianic Jewish movement when care is not taken to protect biblical distinctions. And the result is not leiturgia. It is not the service that the people offer to God. It is, sad to say, confusion. But do not get me wrong. I LOVE liturgy when it is rightly used, just as I love a violin when it is played with a bow, rather than, say, having someone blowing into it! One more point about liturgy. Many people are prejudiced against it. There are some people who imagine that such formalism is stifling to the activity of the Spirit. I would point these people to 2 Chronicles 5, and the description of the dedication of Solomon’s Temple. This was the most formal event imaginable, filled with pomp, incense, priests, Levites–a heavily scripted event. But it is in response to such pomp that the Spirit of God comes in remarkable manifestation and power. I have given you much to think about, discuss, and likely, disagree with here. Fine. Liturgy, rightly used, learned, and appreciated is a holy thing, something ancient yet new, something old yet incredibly alive. I love good liturgy and liturgical prayer. The apostles did too. We read in Acts 2:42, “And they devoted themselves to the apostles’ teaching and the fellowship, to the breaking of bread and the prayers.” These were “the prayers” of the Jewish people. Yeshua told his disciples in their prayer life, “And whenever you stand praying, forgive, if you have anything against anyone, so that your Father also who is in heaven may forgive you your trespasses” (Mark 11:25). They were standing in prayer, as were the Publican and the Pharisee in his parable (Luke 18:9-14), because for Yeshua, the Amidah, the traditional Jewish standing prayer, was normal. He did not have the hangups with liturgy that so many Messianic Jews have inherited. He and the apostles valued the connection with the previous generations of praying Israel. And he did not find rabbinic prayers contaminated because of their origins, as do many semi-informed and ill-informed Messianic believers. What a gulf exists between His world, which was also the apostles’ world, and ours. Sad. If I were more of an optimist, I would expect that a blog like this will engender needed change in the Messianic Movement. But I think not. Still, this needed to be said. In my next blog I will begin talking about something else that is desperately needed if the wind of the Spirit would have His way in us and through us. You bring up the important issue of Hebrew liturgical understanding for messianic Jews, which is a vital importance. Beyond Hebrew liturgical literacy amongst Messianic Jews your post also highlights the necessity for training and materials for non-Jews in the life of Messianic congregations , especially given the over 70% intermarriage rate in the Jewish community which in the next few generations will make for non-Jewish majorities in most non-orthodox Jewish communities, including Reform and Conservative synagogues. This requires a two-pronged approach that includes the teaching of the importance of Hebrew liturgical literacy among the Jews of the congregation and also resources and training for the non-Jews of the Congregations so they can participate in the liturgy without crossing over important lines of Jewish distinctiveness. Thank you for your past three posts as a series addressing the notion of “audience spirituality” and Jewish liturgy as a participatory remedy for it, if only the liturgy would be employed properly and sufficiently. One characteristic of Jewish prayer that I believe should be emphasized is its requirement for kavanah on the part of each individual participant, without which the prayer is worthless and as ineffective as if it had not been offered at all. Without kavanah, liturgy also can become merely an empty rote performance, much as what the prophets decried regarding meaningless Temple sacrifices. But at least it demands of its audience a degree of participation, and thus it implies that each one *ought* to be taking on a personal responsibility to make his or her own participation meaningful. I appreciate also your invocation of distinctive responsibilities for gentile disciples and for Jewish ones as they each evaluate the liturgical words to which they are expected to apply meaning, to recognize that some of the text invokes specifically Jewish responsibilities not required of gentiles, such that gentile disciples must approach these prayers in a different manner and exercise ingenuity toward developing appropriate alternative figurative applications of their principles. Developing such kavanot is an interpretive challenge that is very much a current need within the MJ movement. We are in substantial agreement. Thank you for your astute comment. Liturgy is like a line dance to me. It takes a while to learn it and you may even feel conspicuous as an outsider while you learn. But once you learn it, you can express yourself as an individual who is part of a group. Even if Some people dance in a perfunctory manner it helps to create the background for those who dance with enthusiasm. The enthusiasm is frequently contagious to the perfunctory dancers. Liturgical Prayer is when our walk with God has the ability to become a dance with Him. May we all become joyful dancers. At the risk of a pun, what you are saying here could be seen as a step in the right direction. Still, Jewish liturgy is meant to be multi-individual communal prayer: everyone praying the liturgy him/herself in general synch with the congregation. It is not a performance of course, but rather depends for its force upon the kavvanah–the personal investment and directionality of each participant. And I hasten to emphasize, the problem with MJ liturgical practice, if we can call it that, is that Gentiles and Jews are praying prayers that are meant to enshrine the history and covenantal relationship God has uniquely with the Jewish people. This doesn’t make others to be chopped liver, but life is made up of various simultaneous covenatal relationships. A man may have a covenantal relationship with his lodge brothers; he also has a covenant with his wife. But the lodge brothers do not in any manner enter into that covenant with his wife. Gentiles by the grace of God in Yeshua have a covenantal relationship with the God of Israel. But that is not identical with the relationship Israel has with Him, And without a doubt, in MOST of the MJ movement, but I KNOW NOT ALL, although nearly so, the God-given, God-honoring distinction between the children of Jacob and Gentiles is obscured, violated, resented and denied. And this is a cataclysmic tragedy that has shifted the ideological DNA of the Movement in a direction from which I fear it will not return. You wrote a few statements in one of your recent replies that piqued my interest and curiosity as distinct notions that may lack solid evidentiary foundation. For example, you wrote: “Gentiles by the grace of God in Yeshua have a covenantal relationship with the God of Israel.” Without belittling the grace of G-d in His acceptance and cleansing of any member of the human family who turns back toward Him in repentance via trust in His anointed representative Rav Yeshua, I find no covenant in either the Tenakh or the apostolic writings that applies to gentiles other than the covenant expressed to Noa’h during the recovery period after the great flood. The gentile embrace of the Jewish covenant is by grace alone rather than by covenanted participation. Does that constitute a “covenantal relationship”? Perhaps it may be described thus as an indirect relationship, similarly to the use of metaphor to describe gentiles as “sons of Avraham” (though not of Isaac nor of Jacob). I presume that is what you meant by your immediately subsequent qualifying statement: “But that is not identical with the relationship Israel has with Him,”. I realize that long-standing Christian doctrine has accustomed gentile would-be disciples of Rav Yeshua mistakenly to believe that they are members of the “new covenant” described by Jeremiah and referenced by Rav Yeshua in symbology that he cited during his last meal with his Jewish disciples. This error is undoubtedly a large component of the failure to distinguish between Jewish and gentile disciples that you decry in your subsequent statement. I do wonder, though, if you know of anyone who has attempted to conduct an actual survey of what you referenced as “MOST of the MJ movement”, in order to determine the degree or manner in which this distinction is or is not recognized, whether in viewpoint or in practice? I have begun to wonder if I might be able to formulate questions for such a survey, that might collect responses via the blogosphere. In doing so, of course, I would have to compile selections that include not only definitive MJ viewpoints, but also those of common alternatives that falsely or mistakenly claim the MJ label. Given sufficient response, the analysis of such a survey might quantify just how severe is the condition about which a number of concerned MJ writers have rightly complained. Perhaps, properly formulated, such a survey might even distinguish between the options of “obscured, violated, resented, and denied” relative to the failure to honor “the God-given, God-honoring distinction between the children of Jacob and Gentiles”. At least it would provide the “evidentiary foundation” I invoked above. Finally, while I concur fully with your characterization of the situation as a “cataclysmic tragedy”, and I find your phrase “the ideological DNA of the Movement” picturesque, I wonder how you might elaborate the notion of “ideological DNA”? The notion of DNA has become a generic image of whatever characterizes something at its most fundamental level. In biology, of course, it is also contains the template by which an organism may reproduce itself, as such. Since a social movement such as MJ is defined by its ideology, your concern that it might mutate into a different sort of organism entirely is quite justified. After all, isn’t that really what happened, between the second and fifth centuries CE, to the original movement of Rav-Yeshua disciples? Many of the same forces that impelled that ancient mutation are still in play as a threat to the modern re-emergence and continuance of characteristically-Jewish Rav-Yeshua messianism. More than 15 centuries passed before something like the original strain managed to re-assert itself. I guess we Jewish messianists are not genetically dominant (metaphorically), but perhaps in the intervening centuries we Jews may have developed some immunity with which to resist gentile ideological incursion. If MJ is to survive and thrive as such, perhaps we must assert our distinctiveness more adamantly, so that both we and our gentile brethren may each become more ourselves. Liturgy is like a line dance to me. It takes a while to learn it and you may even feel conspicuous as an outsider while you learn.But once you learn it, you can express yourself as an individual who is part of a group. Even if Some people dance in a perfunctory manner it helps to create the background for those who dance with enthusiasm. The enthusiasm is frequently contagious to the perfunctory dancers. Liturgical Prayer is when our walk with God has the ability to become a dance with Him. May we all become joyful dancers. Here you are brilliant and absolutely right. Great metaphor. And I think your rabbi, whom I know and respect, is doing a fine job of monitoring the congregation, taking its pulse and checking its vital signs, while administering the medicine of the liturgy. My problem is that I DO believe the wider Messianic Jewish Body of Messiah, the congregations and weird-relative type groupings that have attached themselves to the movement, are in varying degrees ideologically unwell, but have grown skilled at ignoring or denying the symptoms. I fear this does not bode well for the patient. Thank you for both of your kind responses. I am blessed to have met you in person the last time you visited our congregation. I´m a Christian not part of the movement, but interested in jewish life and messianic Judaism. I don´t know much about jewish liturgy except some prayers, but I hope you don´t mind me asking. 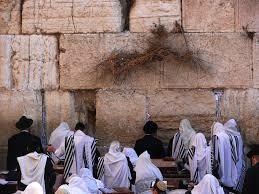 I understand, that some prayers are particular to the jewish historical experience and covenantal identity, an experience we gentiles don´t share in the same way. I understand, that the Sinai event has a much deeper meaning for you than for me – still as a believer every word of God has meaning for me, even I can say I live from every word of His mouth! I could wholeheartedly pray Psalm 119 with devotion (granted, I´m far from living like that, I know how often I don´t do God´s will). So, why not thank God for the giving of Torah? O.k., if the “we”language disturbs you, I would agree to say “who has given Israel the Torah”, but trough Messiah the word of God came to believers from all nations, too. Stuart, I want to honor and support the jewish people living as Jews, I have no problem that some commandements are specifically for the jewish people. What troubles me (and you also, if I understand you right) is to see so much fighting and division about minor theological differences instead of living in unity in the love of Yeshua. Sometimes I´m afraid if you (not you personell) are not overemphazising difference above shared faith and this causes confusion and hurt or will lead to separation. If we cannot live and worship together in harmony how will we be witnesses for the healing and restoring power of Yeshua? What did you mean by”religious noise like a resounding gong…” ? This verse, I think, is about beautiful words without deeds of lovingkindness, but has really nothing to do with gentiles praying jewish prayers! I appreciate your example with the instruments with different tones or the reference to a dance Eric brought up. You are a composer and musician, aren´t you? What about composing a liturgy with slightly different prayers for Jews and Gentiles, which can be prayed or sung like a duett with different voices for men and woman (he -she -together), affirming the other one positively, not in the way “not like” but “like you also through Messiah”? Thank you for your intelligent letters. Your English is splendid. Part of the context of my writings is my experience with people in the Messianic Jewish Movement in the United States. Believe it or not, MANY, in fact I would say the vast majority of people in the movement here, most of them not Jewish, are primarily concerned with Messianic Judaism meeting their needs and accommodating them. These are not bad people, but the leadership of the movement has failed to articulate a proper vision for the movement and to preserve that vision, shaping its congregations accordingly. Here is the problem: I believe God raised up the Messianic Movement to be a sacrificial sign, demonstration, and catalyst of God’s consummating purpose for the Jewish people. All Gentiles and Jews in the movement ought to be serving that purpose above all else. But this is absolutely NOT the case. In its ministry to the Jewish people, the movement is failing badly, and has been failing more deeply with the passage of time. Now the movement is filled with people who believe it is meant to teach Gentiles Judaism-lite. Meanwhile, the Jewish people and their needs and God’s will for them are an afterthought. Nothing I write is anti-Gentile. I do not blame these people for wanting to have what they perceive to be their own needs met. I blame the leadership of the movement for failing to grasp, protect. and articulate that this movement is meant entirely to serve God’s consummating purposes for the Jewish people. But instead, the real agenda items are something else. In both the missions and the Messianic Jewish movements, one finds organizations that are ABOUT the Jews but not TO them. Now you know where I am coming from. And I hope you and others will respect what I say, even if you disagree. I have a question on this discussion on the liturgy, particularly what you say about the Gentiles praying the prayers of the siddur. “This applies to many, nearly all Messianic Congregations. In too many congregations people are saying words they don’t understand which apply to someone else and calling that liturgy. It is not. It is actually just a lot of religious noise, what Paul called elsewhere, “a resounding gong or a clanging cymbal.” There are many fine Gentile people in Messianic Congregations saying prayers that are particular to the Jewish historical experience and covenantal identity. And it is an exercise in confusion or meaninglessness when largely gentile Messianic Congregations say these prayers. Do you mean to imply (or are you actually saying) that Gentiles should not participate in the liturgy or the Torah reading? Since the prayers apply to the Jewish people and the Torah was given to the Jewish people, we who are not Jewish have no part in it and should not take any part in it? (I understand that the movement as a whole isn’t succeeding in reaching Jewish people with the Good News, and Messianic Judaism is meant to be primarily a movement “for Jewish people”, though the context is congregational participation rather than audience-spectator passivity), but is our participation in the services a point of confusion that should be cleared up by our withdrawal or separation from the congregations or non-participation in the service or at least those parts of the service that are meant only for Jewish people (which is essentially all of it)? Is our participation been encouraged somehow only because we haven’t taken enough or proper care to preserve the distinction between Jews and non-Jews? I have had some second thoughts on some of the things we do, such as the Aaronic Benediction because it was assigned to the Jewish Cohanim and not to just anyone, not even a Jewish layperson; but what you seem to imply is that Gentiles have no business participating in the liturgy or Torah reading because we aren’t Jewish and these things have nothing to do with us. If this is the case, then perhaps we shouldn’t even be part of the Messianic movement, period. We should just stick to the churches and support from there and keep our distance, and not participate at all. I know for some in the movement, this would be a perfectly acceptable arrangement.